From Russian food to ramen via hangovers, mac n cheese and charity. 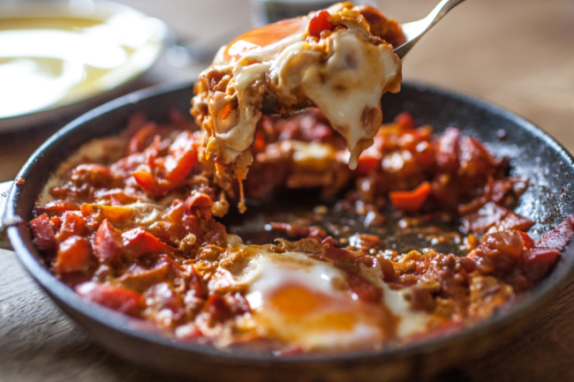 Here’s our pick of 10 of the best foodie pop-ups and residencies to try in April. There’s no danger of running out of room for pudding at any After Hours events, as that’s all you’re going to get. A guest chef will create a three-course pudding menu of creative takes on the last but not least part of the meal for each event, before moving on to homemade chocolates to round things off, accompanied by either coffee or a cocktail. Two events take place this month, both to be held in Ozone Coffee in Shoreditch; on Friday 4 April, the menu will be created Andrew Ditchfield (last year’s Craft Guild of Chefs winner in the pastry category), and on 18 April it will be the turn of Mark Donald, who has worked at Copenhagen’s former ‘best restaurant in the world’ Noma, as well as Hibiscus in Mayfair. Events cost £25 each and can be booked here. Sittings are available at 7.30, 8.30 or 9.30pm. Street food favourite and Street Feast regular Bhangra Burger has won fans for its Indian-inspired balti beef burger, lamb jalfrezi burger and other spicy dishes. As of 10 April, you’ll be able to sit down while tucking in as the stall comes off the street and into Aldgate East’s Apples & Pears bar, on the street that turns into Brick Lane. The bar will lay on cocktails and there’ll even be the opportunity to win prizes, so long as you can handle a chilli challenge. Bhangra Burgers will be serving from Thursday to Saturday, from 5 to 10pm. The Live Below The Line challenge runs officially from 28 April-2 May, and will encourage people to try and live on just £1 a day in order to raise awareness of extreme poverty — both at home and abroad. This New Cross supperclub is joining the cause by preparing a three course meal costing just £1 per person for ingredients. While we’re told that the ticket price of £15 will still feel like a bloody good deal for what you get, rest assured that all profits raised will be donated straight to the cause. The event runs on Saturday 26 April from 8pm, book tickets for £15 here. The exact location in the New Cross area will be revealed on booking. Reasonably priced wine and other drinks will be available on the night. Katrina and Karina are London ladies with roots in Russia. Their regular Revels are a chance to live it up Soviet-style without getting anywhere near a pillock like Putin. Now they’re doing what the Russian authorities are unlikely ever to do, and letting us in on their secrets with an evening devoted to teaching guests how to cook the best of their repertoire. Set at The Trainee Chef cookery school in Hackney, there’ll be plenty of eating and drinking alongside hands-on lessons in how to make Russian dumplings, pastries, kievs and more. The event takes place on 16 April and costs £60. Tickets are available here. The secret location in E9 will be revealed on booking. The Hangover Club runs on Saturdays 5, 12, 19 and 26 of April, with sittings at 10am, midday and 2pm. You can book tickets for £8 (the price of a dish), or just try your luck on the day. Indie Ales is on a mission to get London tasting and enjoying more ales, craft beers and unique brews — something that we’re totally on board with. This St George’s Day, it's taking over a pub in the Clapham/Stockwell area and hosting a tasting evening of all-British brews, complete with some equally patriotic bar snacks specially matched to each beer. Tickets cost £25 and include a two-hour tutored tasting, generous quantities of beer and plenty to eat. The evening starts at 7pm with the exact location to be revealed on booking. Check the Indie Ales site nearer the time for more details. Deli and grocery shop Melrose & Morgan already has two delis-come-grocery shops in Hampstead and Primrose Hill, and as of 11 April it’ll be popping-up in Selfridges, too. Shoppers will be able to pop-in for sandwiches, tarts, cakes and bakes made from many of the same carefully sourced ingredients that you can find in the company’s two delis, as well as buying other freshly prepared items to take home. Open during Selfridges usual hours. Noodle-loving United Ramen is embracing London's current love for all things stateside in this two-day residency at Islington’s The House of Wolf. The fusion-food menu features yakitori chicken wings and chicken skin maki rolls as warm-up to a bowl of BBQ pulled chicken, bacon and sweetcorn ramen in a rich chicken bone broth. Strawberry mochi cheesecake rounds things off, while a full bar will operate throughout. Tickets cost £25 including all food (drinks to be bought separately). The event runs on Wednesday 16 and Thursday 17 April, with the bar opening from 6pm each day and dinner served at 7.30pm. Tickets are selling fast. A regular on London’s pop-up scene, the couple behind The Wandering Chef are back with another series of events. And judging by previous occasions, they’re destined to sell-out pretty quickly. The latest incarnation is called Voodoo Blues, and is set on bringing the Deep South to Soho, with the weekly Friday night events described as a ‘bizarre journey through the heady, debauched and frenetic nightlife of the Mississippi Delta’. We’re not sure exactly what that means, but we do know that previous Wandering Chef events we’ve been to have been brilliant, foodie and furiously drink-fuelled occasions that we’d highly recommend. A creole menu created for the events encompasses salt beef, soft-shell crab, shrimp, grits and bourbon — which only encourages us. Voodoo Blues runs on 4, 18, 25 April and 2, 9, 16 May. Tickets cost £55 including seven courses and are available here. Previously spotted popping-up at Translate bar in Shoreditch at the end of last year, this indulgent outfit has found a semi-permanent home in Bayswater. Alongside the classic, pick from a changing list of mac and cheeses spiked with jalapenos, infused with truffles or mixed with beetroot while supping cocktails from an equally experimental menu. Oh, and just in case it sways you: dessert comes in the form of deep-fried Oreo cookies. Thought it might. 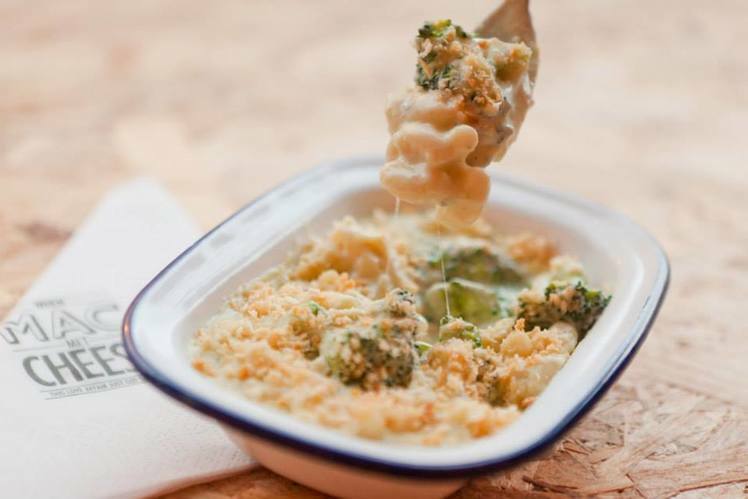 When Mac Met Cheese is at 43-45 Porchester Road, W2 5DP. It’s open from 6.30 to 10pm Wednesday to Thursday, 6.30pm to midnight on Friday, midday to midnight on Saturday and midday until 5pm on Sunday.